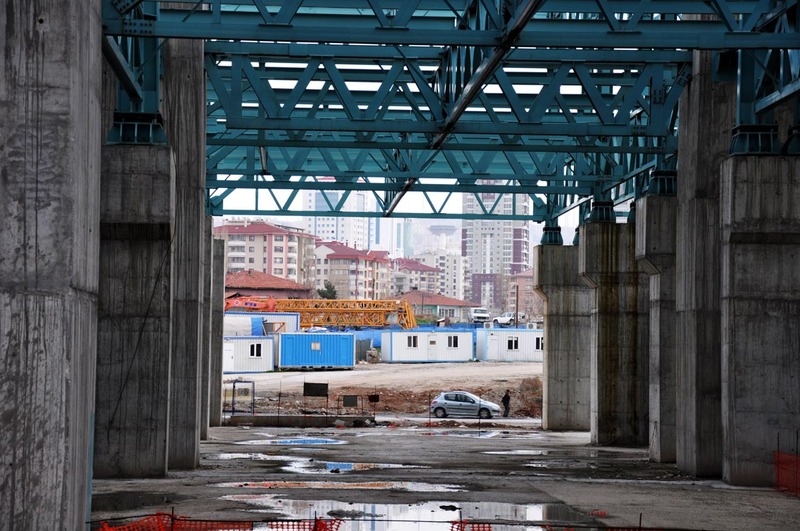 As Ankara’s population continues to explode, its city structure is shifting. 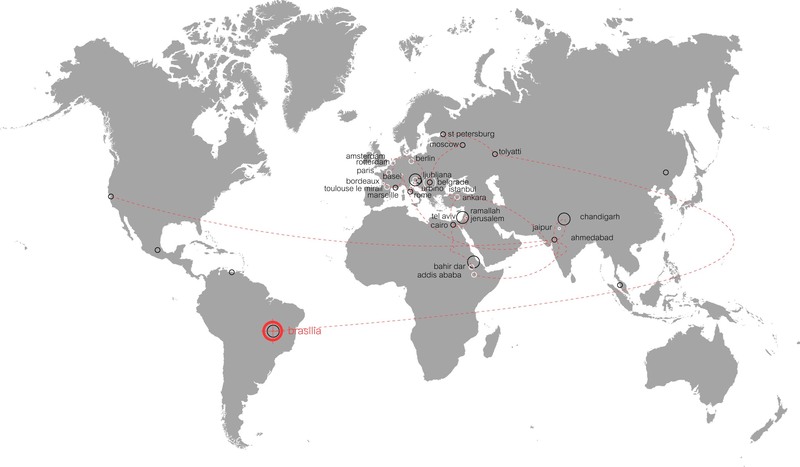 Hemmed in on the north, south and east edges by mountains, the city has reached capacity in these directions, leaving one path for growth: along the western corridor of the valley in which the city sits. 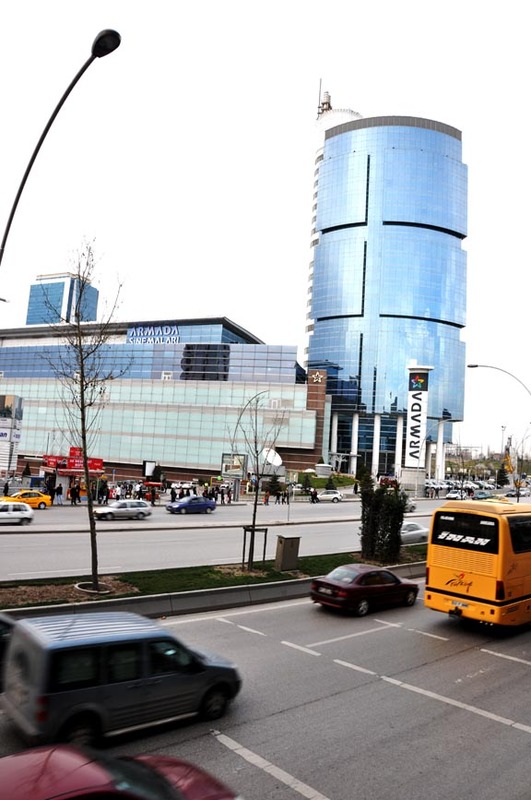 Not only bring change to the commercial centers of Ankara, the lopsided growth has also shifted the main axis in the city. Originally a single north-south thoroughfare guided development. By the new master plan in the 1960s, 2 crossing axes made the city’s transit structure. By now, the east-west axis has grown to dominate, and the heaviest traffic volumes run along this route, with those who are able moving west as quickly as possible. Ataturk Bulvari (N-S) is certainly still important, and contains the monumental governmental center, but its rival, Eskisehir Bulvari (E-W) and up and coming Istanbul Caddesi (E-W) pull Ankara’s center of gravity further and further west, consequently pushing the original centers (both old and new) to the edge. 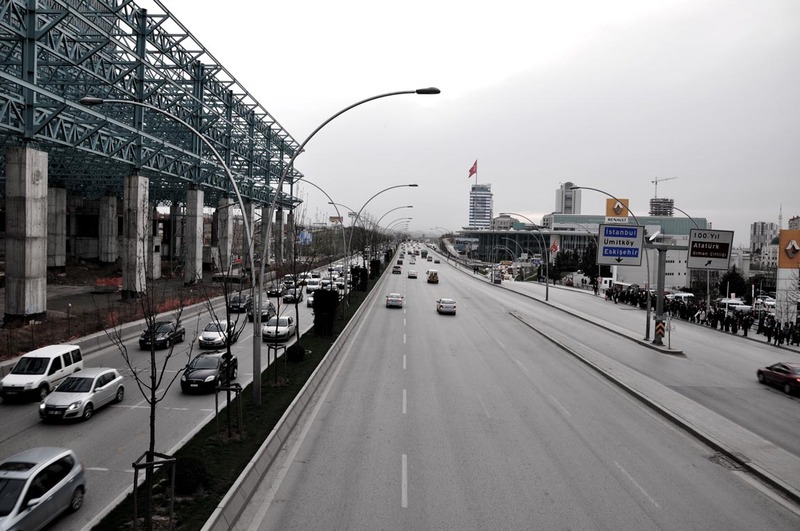 Unfortunately for the most part the new areas of Ankara that I observed are built speculatively, with little thought for their role in the urban environment. If anyone knows of any projects working to integrate, or areas where something more interesting is happening, please let me know! A generous couple, two new friends of mine, Harbhajan and Jit Singh, took me around the periphery of Chandigarh, driving down all the back roads of Chandigarh that I couldn’t quite reach on my own. Thank you for your time, and the delicious paranthas, chaat and gulabjammun that came along with the ride! Chandigarh’s Sectors are the topics of many discussions on the city. But what about the edge? How do the sectors end? Where does farmland start? I spent that day and a few others looking at various supporters of Chandigarh: INDUSTRIAL (phases 1 and 2, and the Rajiv Gandhi Chandigarh Technology Park), COMMERCIAL (D2, the “city centre” mall in CTP, and the Grain and Timber markets), RESIDENTIAL (6 story flats continue endlessly in the outer sectors of Panchkula and in Zirakpur), ADMINISTRATIVE (institutional architecture throughout the territory), and LEISURE (a golf course skirts the river). In organization, these areas hardly conform to the structure of Chandigarh. Some structures, notably those in older parts of the Industrial Areas and in the markets, maintain the brick standard and follow the ‘modernist’ vocabulary. 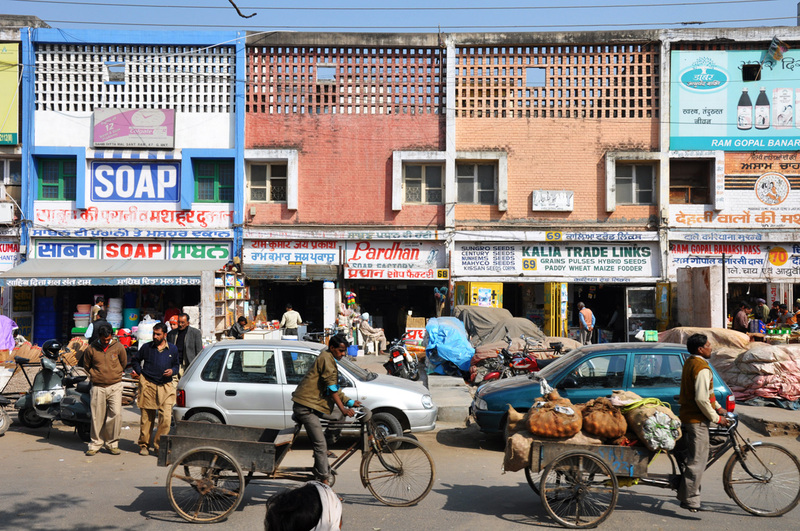 But overall, these non-conforming areas, which cover more area than the city itself and house an equally large population, begin to break down the idea of Chandigarh as a city in isolation, the only (successful) completely planned city in India. 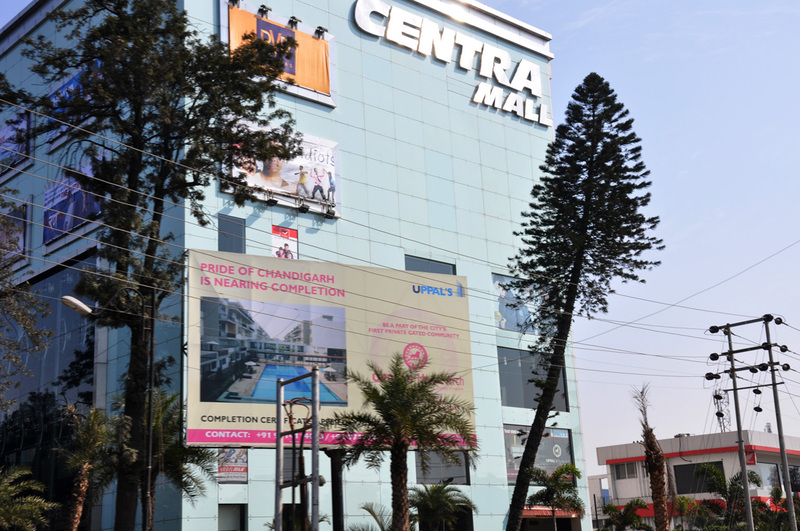 The grid has become the city center, almost equivalent to the “old city” in other metros, and Chandigarh’s growth has extended far beyond the plan. 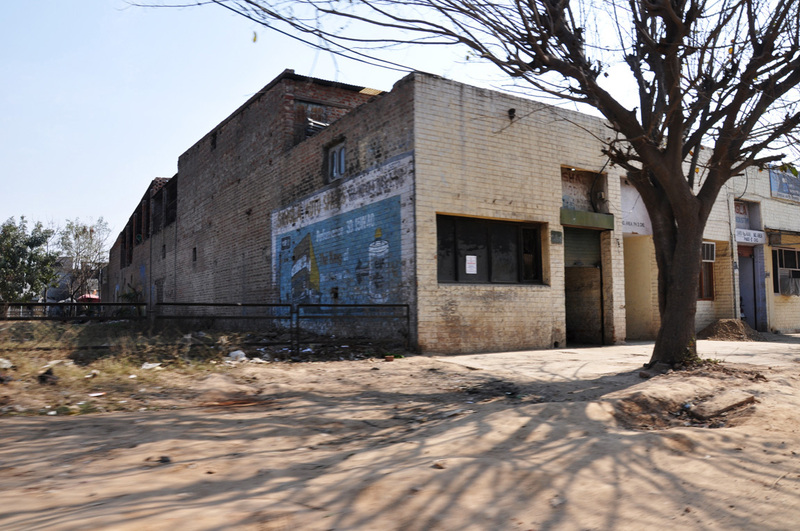 A light industrial phase for Chandigarh was planned at the southeast edge of the city. Original buildings followed the Chandigarh brick mandate, but are organized into arms that branch from the main route into the city, Madhya Marg. 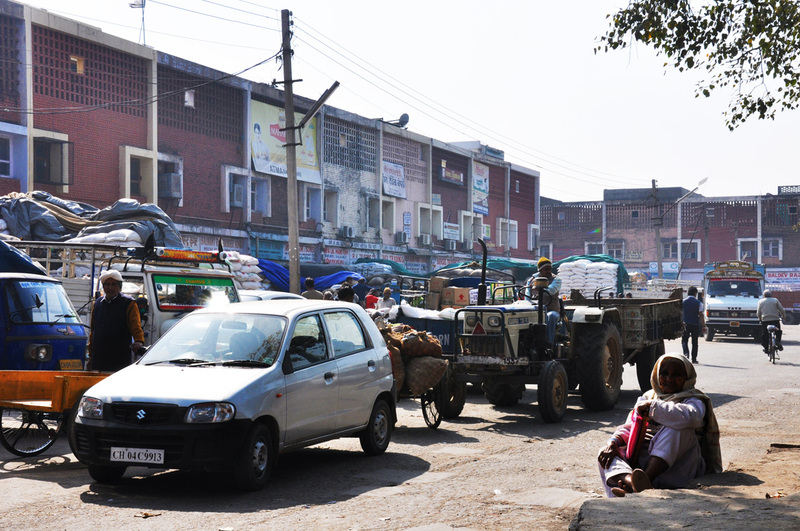 The grain market in the north takes the most from Chandigarh’s building codes by simply scaling up the facades and enlarging the central “park” space for the movement of trucks. 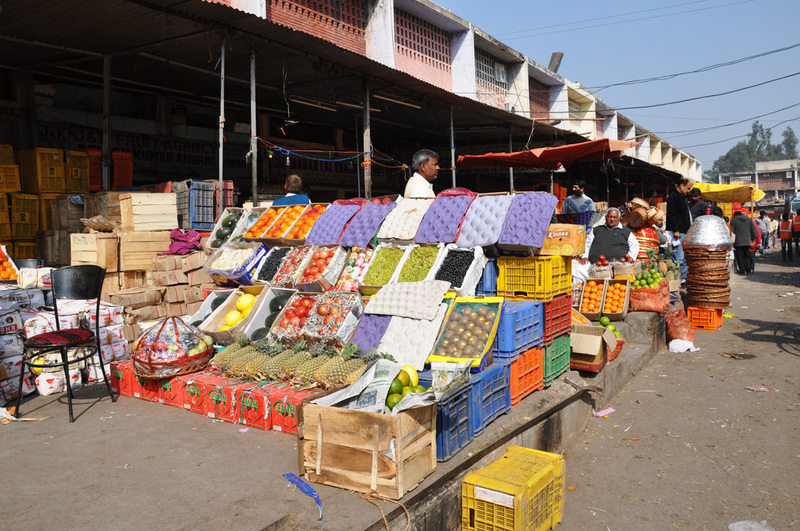 Alongside it, a vegetable market uses the space in front of the buildings to show produce. Phase 1 uses brick, but that is where the similarity ends. Phase 2 moves even further away with its (now commercial) glass and aluminum clad concrete frame structures. Here the brick is hidden deep within the wall. 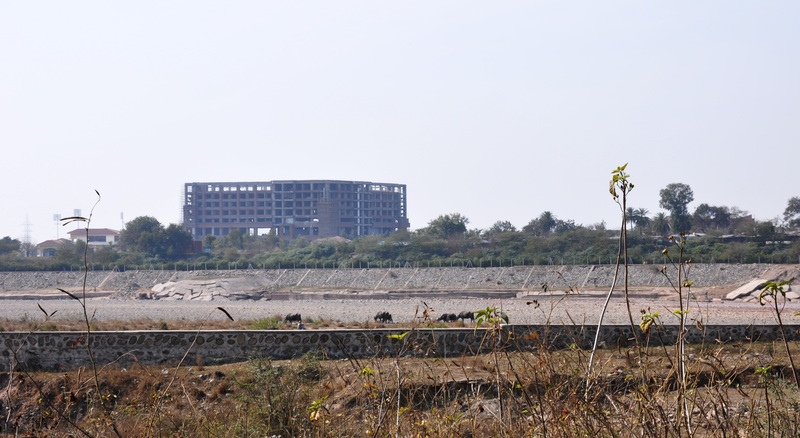 Rajiv Gandhi Technology Park is the new high tech economic incentive zone, located between Chandigarh and Panchkula. Designed to hold various tech company headquarters, whose buildings compete to outdo each other in glass, steel and cantilevers, it now also includes Chandigarh’s biggest cinema complex. Housing at this point is limited to slums. 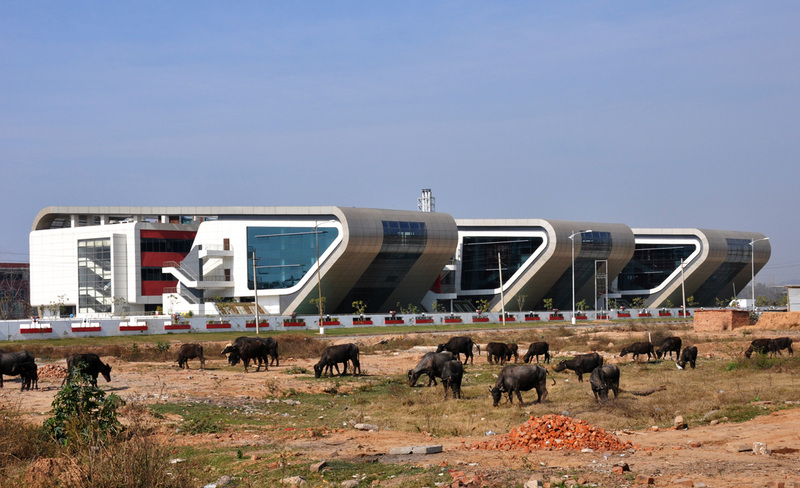 The Airtel HQ, like most of the buildings in the brand new technology park, sits isolated among fields. Infrastructure is at a minimum as yet, and each structure must supply at least a complete back up system for power and water, usually more. 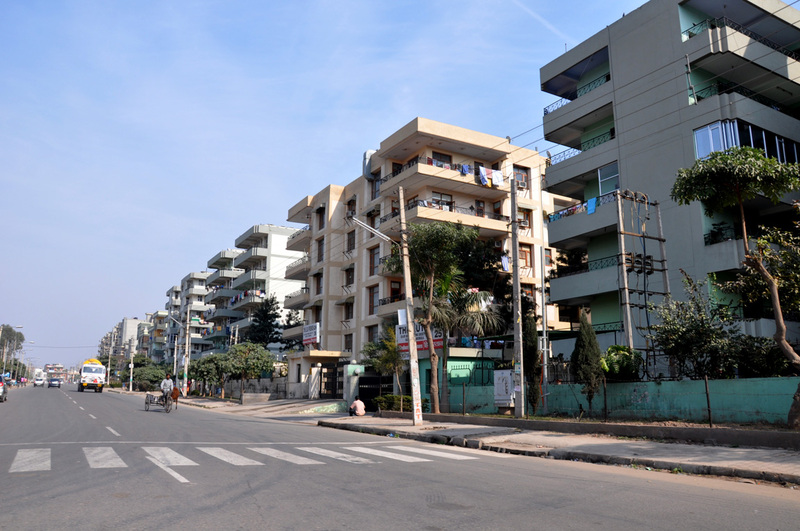 Chandigarh’s 3 and sometimes 4 story cap on structures has pushed the housing demand to the periphery of the city, where stacks of 6 or 7 story apartments line the newly paved streets. Here everything is a little bigger…the buildings, the roads, the commercial zones and parking areas, as well as the parks. 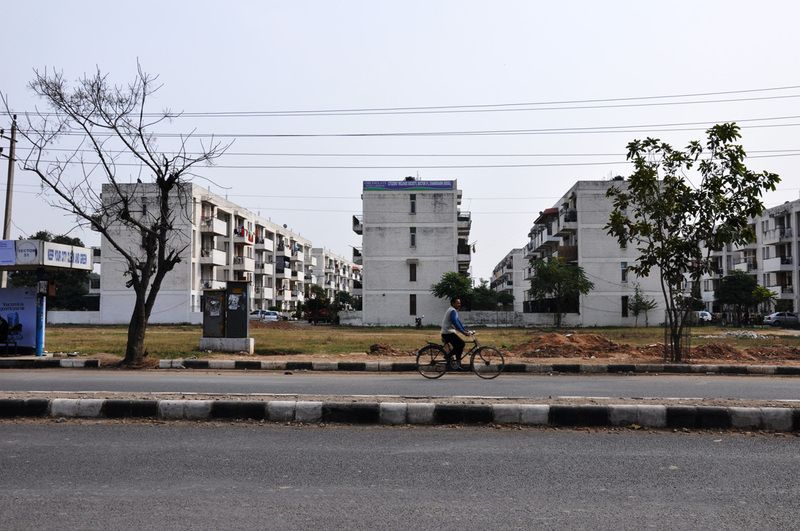 Sector 52, a border sector between Chandigarh and Mohali contains denser strips of housing, separated by lawns. 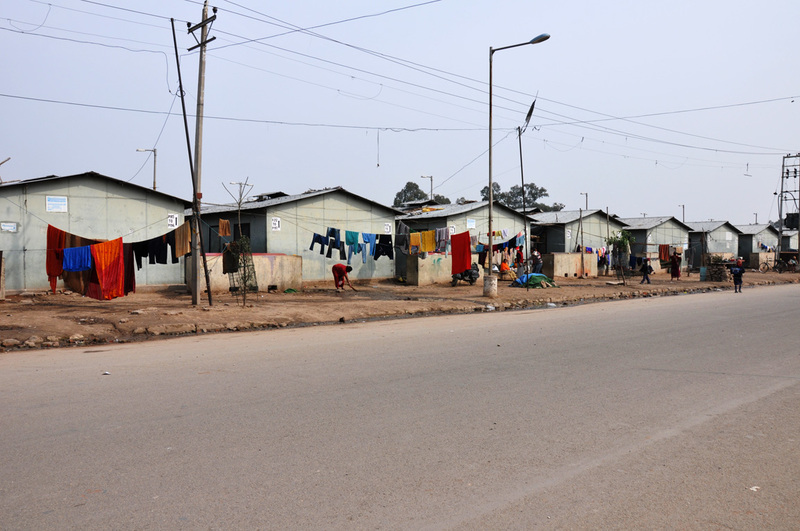 Across the street, Chandigarh’s slum resettlement efforts are exhibited in the rows of aluminum roofed, 2-room houses. 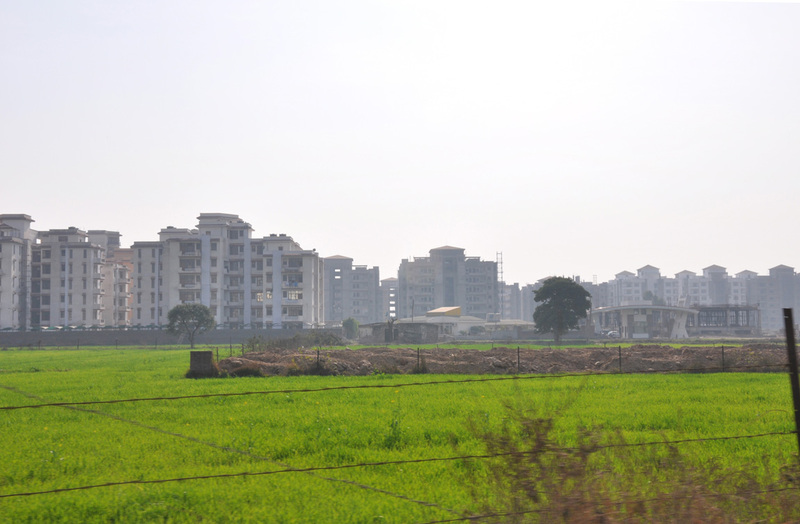 Further out in Panchkula and south in Zirakpur attempts to maintain a Chandigarh fabric seem to be completely gone, and apartment blocks and societies mimic other metropolitan areas of India. 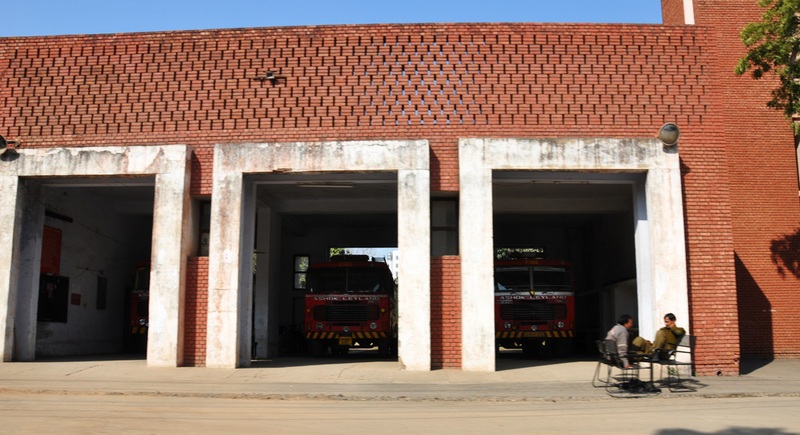 The administration follows the original intent of the bylaws to a T, peppering the landscape in and around Chandigarh with exposed brick buildings that carefully follow the styles of the sixties. These maintain a visual coherence even when private architecture has moved completely away from its origins. So it seems that the further one moves from the center of the region, Chandigarh (and further from by-law enforcement) the less settlements resemble the structure of the original plan. A few strands remain: sector structure of Panchkula and Mohali, commercial arcade construction, and the presence of parks (though these are less) are a few. It makes sense that the pattern would have to change at the urban/rural edge…but how it happens appears to be an abrupt change from controlled rationality to random acts of development. I would like to make more sense of the seemingly random developments that make up Chandigarh’s edge…maybe patterns will emerge with more mapping.